The Big Bang is a model for the beginning of the evolution of the Universe. Even if we do not completely understand all the steps in the evolution, the Big Bang model is the one which is in best agreement with current observations. The areas which are not so well understood are on the one hand the very early epoch (before 10-34s) and on the other hand structure formation, that is the creation of stars and galaxies. 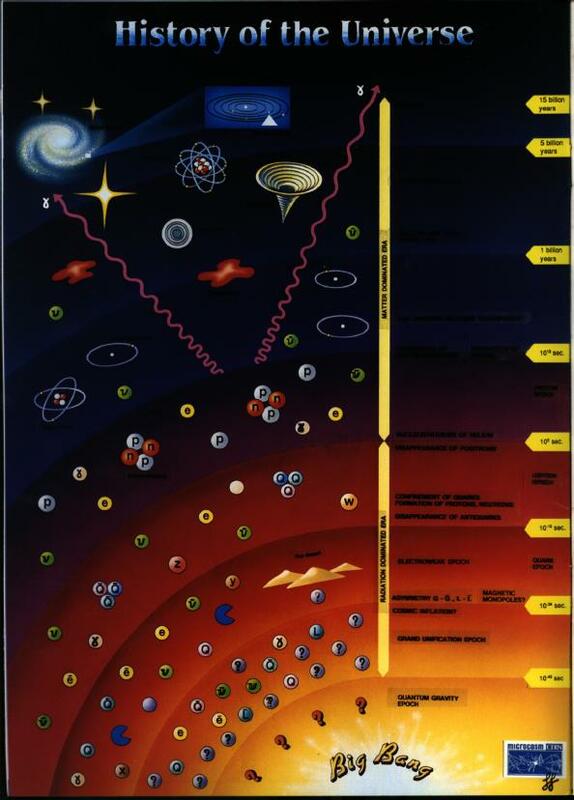 Click on the picture to get more information about the different phases of the evolution of the Universe. There is also an enlarged version of this picture. In this theory it is assumed that the Universe is expanding from the beginning; however, nothing is predicted about the end. Since energy cannot be created, the energy density must decrease as the universe expands. This mainly proceeds by a reduction of the average photon energy (the temperature decreases). When the temperature is low enough, stable states with binding energy larger than the average photon energy can be formed. This means that the reaction A+B<-->AB+photon is no longer in equilibrium but is driven toward the creation of AB. As the average photon energy decreases, an increasing number of particles and composite particles can be produced. 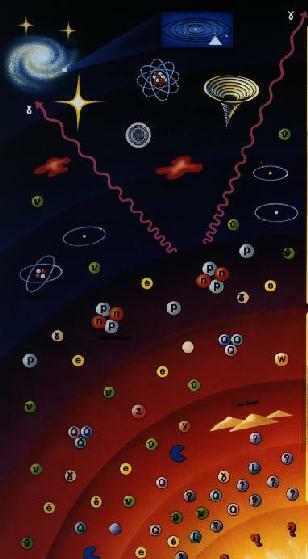 According to the model hadrons are formed first, then atomic nuclei, and finally atoms and molecules. The photon radiation that is left over after the atoms and molecules have been formed is left as a remnant in the Universe today. Since the Universe is expanding, this background is not constant but evolves with time, which means that its temperature decreases. This radiation has been measured very precisely today and it is called the cosmic microwave background radiation. In analogy with the photon background there is also a background radiation consisting of neutrinos. Astronomical objects with sizes of a planet and larger do not have the same production mechanism as single particles. One thinks that they have been produced from inhomogeneities (irregularities) that existed in the early universe when the atoms were formed. These inhomogeneities have then been amplified through gravitational interactions. Finally the atoms have been lumped into galaxies and other larger objects. However, these conditions are not sufficient to form life, since only the lightest elements (H, He, Li) have been formed so far. The slightly heavier elements (C, N, O) which are vital for all molecules in living matter are formed through fusion in stars. To be able to form life as we know it, other elements are also needed such as metals and trace elements (Fe, Mn, Si, Se). Most of these can be formed in fusion processes in stars, but the elements heavier than iron can only be created in supernovas. Therefore, life could not form around the first generation of stars, but only in later generations to which our sun belongs.